^ a b "2012–13 NHL regular season schedule". National Hockey League. Retrieved January 13, 2013. ^ "Bettman confirms Pittsburgh as 2012 NHL Entry Draft site". The Sports Network. October 27, 2012. Retrieved December 7, 2011. ^ "Sabres Loan Eligible Players To Rochester, Amateur Clubs – Buffalo Sabres – News". Sabres.nhl.com. Retrieved May 6, 2013. ^ ESPN.com news services (July 14, 2012). "Sources: NHL makes first CBA offer". espn.go.com. Retrieved July 15, 2012. ^ "Quebec Labour Board rules in NHL's favor – NHL.com – News". Nhl.com. September 14, 2012. Retrieved May 6, 2013. ^ Karlsson, Erik (December 18, 2012). "Marknadsdomstolen ger Hockeyligan rätt". Aftonbladet (in Swedish). Retrieved January 13, 2013. ^ "NHL announces cancellation of 2012-13 regular-season schedule through January 14". nhl.com. National Hockey League. December 20, 2012. Retrieved December 20, 2012. ^ "NHL announces cancellation of 2012-13 regular-season schedule through December 30 - NHL.com - News". NHL.com. Retrieved May 6, 2013. ^ Katie Strang (January 9, 2012). "Board ratifies NHL agreement". ESPN. Retrieved January 9, 2012. ^ a b "Union ratifies new CBA". National Hockey League. January 12, 2012. Retrieved January 12, 2012. ^ "NHL, NHLPA sign Collective Bargaining Agreement". National Hockey League. January 12, 2013. Retrieved January 13, 2013. ^ Shoalts, David (December 5, 2011). "NHL governors approve four-conference format". Globe and Mail. Retrieved December 6, 2011. ^ Canadian Press (June 28, 2012). "NHL's salary cap rises $5.9 million to $70.2 million". Vancouver Sun. Retrieved July 13, 2012. ^ "New York Islanders following Nets to Brooklyn". ESPN.com. Retrieved October 24, 2012. ^ Nicholas Goss (January 23, 2013). "Breaking Down the Rule Changes for the 2013 NHL Season". Bleacher Report. Retrieved January 24, 2013. ^ NHL.com (November 2, 2012). "NHL announces cancellation of 2013 Bridgestone NHL Winter Classic & SiriusXM Hockeytown Winter Festival". Retrieved November 5, 2012. ^ TSN.ca (November 2, 2012). "NHL announces cancellation of 2013 Winter Classic". Retrieved November 5, 2012. 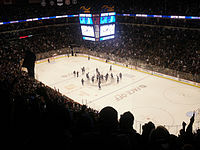 ^ "Columbus Blue Jackets to Host 2013 NHL All-Star Celebration". Columbus Blue Jackets. January 28, 2012. Retrieved February 9, 2012. ^ "NHL cancels next year's games in Europe". CBC News. March 14, 2012. Retrieved May 22, 2012. ^ Chesnokov, Dmitry (March 12, 2012). "Brooklyn Nets arena will host KHL regular-season games, according to Medvedev". Puck Daddy. Retrieved April 25, 2012. ^ "Postponed Ottawa Senators at Boston Bruins game rescheduled for April 28 at TD Garden - NHL.com - News". NHL.com. April 16, 2013. Retrieved May 6, 2013. ^ "Tonight's Pittsburgh at Boston game postponed to Saturday; Buffalo at Pittsburgh game moved to Tuesday - NHL.com - News". NHL.com. April 19, 2013. Retrieved May 6, 2013. ^ "2012-2013 NHL Attendance - National Hockey League - ESPN". Espn.go.com. Retrieved September 13, 2013. ^ Sheldon Souray [@SSouray] (June 30, 2015). "Seems like yesterday!!! I'm going to enjoy my last day today on an @NHL roster!! #whataride @NHLDevils" (Tweet) – via Twitter. ^ Rosen, Dan (January 21, 2013). "Lecavalier reaches 1,000-game mark with Lightning". National Hockey League. Retrieved March 6, 2013. ^ "Devils vs. Canadiens: Patrik Elias records 900th career point, but New Jersey loses in overtime to Montreal". The Sporting News. Associated Press. January 27, 2013. Retrieved March 6, 2013. ^ "NHL Capsules: Anaheim Ducks hand San Jose Sharks first regulation defeat". National Hockey League. February 5, 2013. Retrieved March 6, 2013. ^ "Red Wings Blues: Mrazek Debuts, Helps Detroit Defeat St. Louis 5-1". The Huffington Post. Associated Press. February 7, 2013. Retrieved March 6, 2013. ^ "Games-played leaders with one team". New Jersey Devils. February 9, 2013. Retrieved March 6, 2013. ^ Canavan, Tom (February 9, 2013). "Henrique's goal gives Devils 3-1 win over Penguins". NBC Sports. Retrieved March 6, 2013. ^ Carlson, Matt (February 23, 2013). "Blackhawks set NHL record with 2-1 win over Sharks". Yahoo!. Retrieved March 6, 2013. ^ Kuc, Chris (March 2, 2013). "1,000th game an honor for Hossa". Chicago Tribune. Retrieved March 6, 2013. ^ "Chicago Blackhawks Extend Point Streak to 25 Games". Rantsports.com. Retrieved May 6, 2013. ^ "Senators fall short again in loss to Penguins". National Hockey League. April 23, 2013. ^ "Isles send Habs to 1st regulation loss in month". Sports Illustrated. Associated Press. March 6, 2013. Retrieved March 6, 2013.